Philadelphia Phillies 1B coach and PBI advisor Sam Perlozzo answers your baseball-related questions. Do you have a question for Sam? 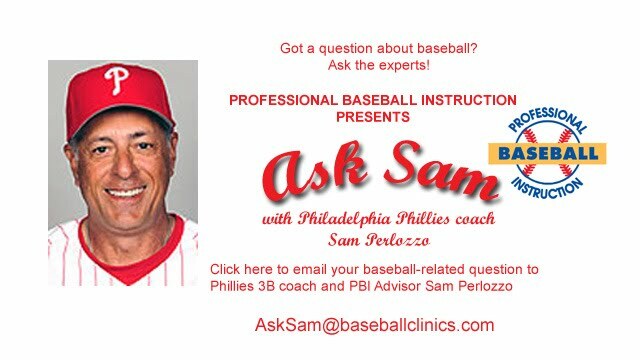 Ask it here – AskSam@baseballclinics.com. Q: Sam, how could it be that a pitcher doesn’t have a particular pitch on a particular day? You hear all the time that a pitcher “doesnt have his curveball” etc. I know of no other field where a person doesn’t have a particular skill on a particular day, even in sports. A: I think you are misunderstanding the real meaning of not having a pitch that day. They don’t mean he doesn’t have that skill that day, they mean that he isn’t throwing it as well as he normally does. In other words, he has his curveball but it isn’t curving much therefore opposing hitters are hitting it better. Or he has a fastball but his velocity is down for some reason, therefore making it easier to hit. Or that his fastball is not hitting the corners as it usually does, therefore the other hitters are hitting him better. Basically, that expression means that you have all your pitches all the time, but sometimes they aren’t as good as normal and you won’t enjoy the same success as you would if they were working better. A: Mike, I am not so sure I would necessarily call it retaliation, but I do think you should not let the other team push you around. I’ve never believed you should do anything dirty or cheap to injure the opposing player. Never throw at someone’s head as to really harm them. I do feel like if the other team is sliding hard into 2nd, then our team should do the same. There are ways to take people out that are clean and still not be considered dirty play. If it is obvious that an opposing pitcher hits a few of your team then you may want to hit one of their players but that pitch must never be thrown in the head area. It is sort of an unwritten rule in baseball. The only time it gets ugly is when there is a stupid player that causes problems….not good, and thats when fights break out. Major League Baseball has done a much better job of controlling unruly play by certain players and it helps things from getting out of hand. Sportsmanship is always first and foremost. Cool heads prevail as we continue to count on our Umpires to ward off trouble before it escalates too far. A: Doc, without getting into too much trouble it sounds as though you are living your love of the game through your children. Trust me, I know how you feel. I had a son who was drafted but never made it. I would have loved to see him make it to the big leagues. But you can’t make it for them. They have to want it bad enough or they will fail for sure. I always pushed a little, more so as to get more practice in but never forced them to love something just because I did. You sound like a great supporter of your kids and that is very helpful to their efforts. Give them some breathing room…talk to them and find out where they stand; it has to be their passion also. After you find out what they really want, you will be free to be the “phanatic” fan that I know you are. We have many of them in Philly!!! Enjoy your kids….it doesn’t last near as long as we would like!! Get them an education first…they will be eternally grateful for that.